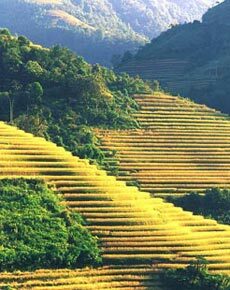 Village tourism has been emerged as a very new cocept in the Vietnam tourism industry. A brand new concept of village tourism where the guests - YOU would be taken to the carefully picked up village where you would be given the chances to know the local people, their culture by allowing them to stay on one of the house as a family member. A few guest room and kitchen are developed without disturbing the village environment. Villages continue their daily normal works and guests enjoy participating in the village activities. As you would be staying as a family member with your host family, you can participate in all activities of their daily choirs. The friendly and hearty behaviors of the family members gives you a different experience that you have never enjoyed before. You have the chance to eat the traditional local food prepared in the neat and clean kitchen, which are delicious and are hygienic. The notable feature of these tourist villages is that their symbolic tradition and customs are closely attached to the growth of the famous local cultural men. For example, in Thanh Tri village; the communal house, temples, pagodas, altars, village pond, etc., all are related to General Pham Tu of the Early Ly dynasty, the philosopher teacher Chu Van An of the Tran dynasty, and the Buddhist Ancestor Vinh Nghiem. The local scenery, through many historical ups and downs, is still preserved with its characteristics in harmony with the ancient architecture. Like other visitors to the village, you will be surprised at this “silk shop town”, where almost all houses along the paths have been turned into shops selling silk products. Specifically, the village is now home to 1,280 households, 90% of whom are involved in silk production and business. The village makes more than 2 million meters of silk per year. Yet, more than that, you are offered a good chance to explore the Vietnamese traditional industry of silk-making. 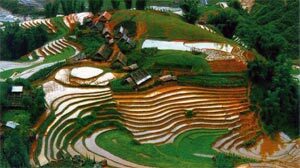 The Prime Minister has adopted a master plan to build a Vietnamese Ethnic Tourism Cultural Village, a national tourist, sports and cultural centre to gather all traditional heritages of ethnic groups in Vietnam. 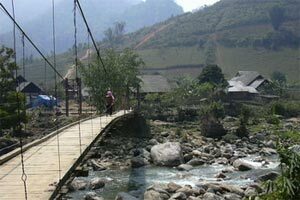 The project, covering 1,540ha near Dong Mo-Ngai Son lake in Hanoi’s Son Tay district, will be managed by the Ministry of Culture, Sports and Tourism. The village will be a place for ethnic groups nationwide to meet, discuss their individual cultures, strengthen solidarity and develop their ethnic cultural values. In addition, the place will meet the entertainment demands of domestic and foreign visitors.